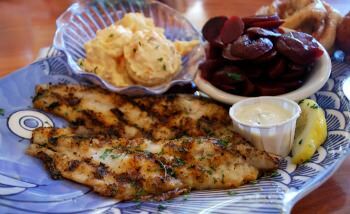 We've got you covered with a handful of good old fashioned homestyle catfish recipes that have a restaurant like style flare and a desired fresh taste. Whether you're buying your own fillets from the grocery store, or you've caught and cleaned your own catfish fillets, it becomes time to reward yourself and others to a nice little feast. So let's fire up the barbecue grill station or turn the burners on your stove, because it's about to go down! We also provide a lighter seasoned version for this recipe as well. Sprinkle fillets with 2 teaspoons lemon juice. Lightly coat the fish with cooking spray. Season with the cajun seasoning. Spray the catfish fillets once more. In a large skillet over medium-high heat, add 2 fillets, seasoned side down. Cook the fish for 3 minutes. Then reduce heat to medium and cook the catfish fillets for 3 more minutes until the fish begins to flake when tested with a fork. Serve with tarter sauce and rice if desired, or a simple side and sauce of your choice. Here's a light version for Cajun Catfish. Place the catfish directly on the grill. (You may also opt to place them on a sheet of heavy duty tin foil, or to use a fish grilling rack .) Cover the fillets evenly with ranch dressing. Grill over medium-hot coals for 20-30 minutes, and/or until the fish flakes easily with a fork. Sprinkle with dill and lemon wedges. 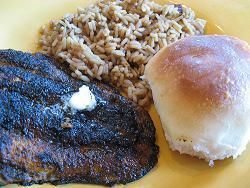 Here's a BBQ style recipe for Grilled Catfish. 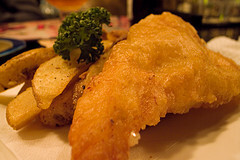 Check out this homestyle recipe for Southern Fried Catfish. This is basically a fish and chips mash up. It's simply easy and fun to make with the kids in mind. Along with a side of french fries and their favorite dipping sauces, they might even say that it tastes just like chicken.